WATCH: Pacquiao vs. Mayweather weigh-in full video replay - Balita Boss! 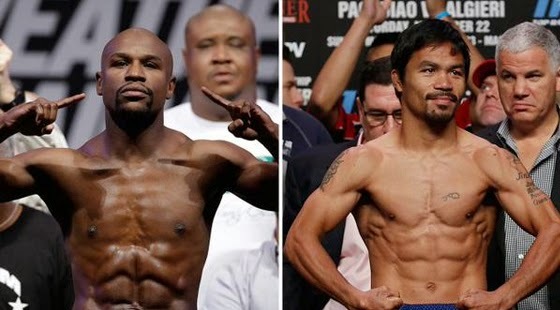 LIVE STREAM: Floyd Mayweather and Manny Pacquiao tip the scale at the weigh-in one day before they clash in one of the most anticipated fights in boxing history. Floyd Mayweather and Manny Pacquiao made weight in front of 10,000 fans at the MGM Grand Garden Arena in Las Vegas for their anticipated "Fight of the Century" showdown. Video courtesy of Showtime. You can watch also the weigh-in on ESPN or HBO. The undercard fighters that also weighed-in were Leo Santa Cruz against Anthony Settoul; Vasyl Lomachenko will face Gamalier Rodriguez; Jesse Hart will meet Mike Jimenez; Christopher Pearson against Said El Harrak; Andrew Tabiti will face Anthony Caputo Smith; and Brad Solomon against Adrian Granados.